Forest Pitch saw the creation of a full-size football pitch in the middle of a Spruce plantation in the Scottish Borders. The site was used as a football pitch for one day, before being left to grow back and be reclaimed by nature. The teams – two male and two female – consisted of amateur players from all over Scotland, some whom had never played football before. The majority of the players were recent British citizens or those with Leave to Remain. Watched by around 500 spectators and followed on line via a live internet broadcast, the players wore unique and imaginative team strips designed by Scottish school children, and manufactured by Copa. Spruce trees felled to make space for the pitch were used to create the goalposts, benches and a changing room. In December 2012, the site was planted with over 800 native trees along the white lines of the pitch, creating an evolving, living sculpture. The site will be freely accessible to the public for up to 60 years. This artwork invites us to explore our views on landscape, memory, diversity, community, competition, ecology and national identity. Forest Pitch was part of the London 2012 Festival and is an Artists taking the lead commission supported by Creative Scotland in partnership with the Arts Council of England. For more information please contact craig&commat;craigcoulthard.com. 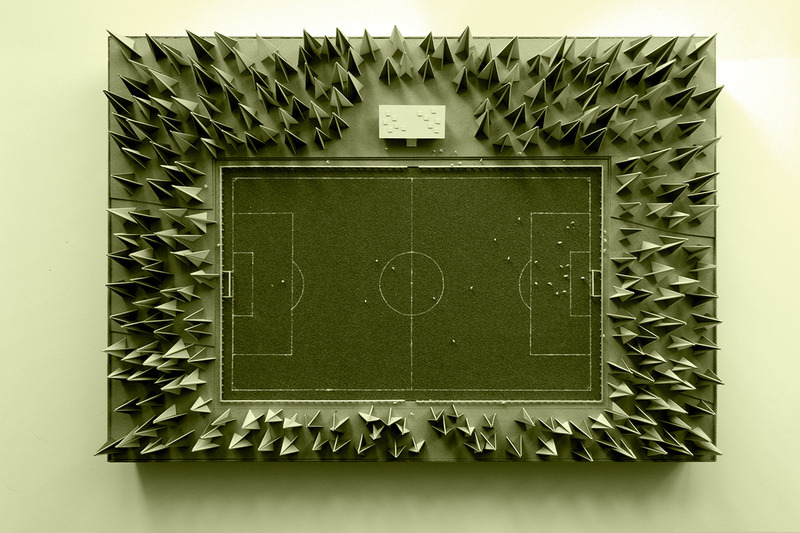 Forest Pitch is an artwork by Craig Coulthard. The matches took place on 25/08/2012. Part of the London 2012 Festival & Cultural Olympiad.